Whenever you add a label to an email message in Gmail, it will automatically have a color associated with it. This feature allows you to see a color-coded inbox to quickly locate emails pertaining to a certain topic or group for which you have created a label. 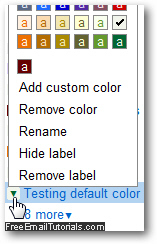 But you can at any point change the color for that particular label, from a set of 24 standard colors built into Gmail, as you'll learn in this tutorial; the next tutorial will show you how to create a custom color for a Gmail label. If you change the color of that label, Gmail will update not only the color swatch in the labels listing on the left, but on every email message to which you assigned that label (you won't have a variety of colors for that same label, in other words). Google Mail / Gmail will also display a confirmation message at the top of the screen: "The color for label '[your-label-name' was adjusted". Unlike other change of settings, you will not see an Undo link appear to revert to the original color. And this is all you have to do to update your preferences and choose another color for an email label in your Gmail account.